Electrical storms are one of the deadliest and most widespread weather occurrences in the world. Lightning is an electrical discharge between the ground and the clouds that results from an imbalance of charges; the lightning strike is how those charges are rebalanced. 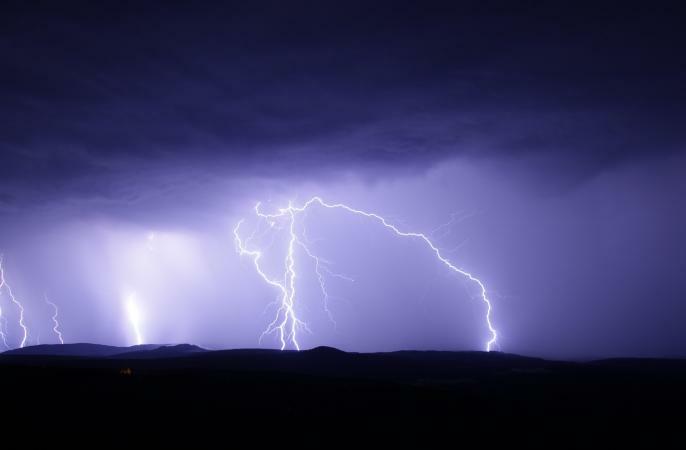 Every part of the world experiences thunderstorms and lightning strikes, but the upside of that regularity is that more than 90 percent of individuals who are struck by lightning survive the strike, many of them without lasting damage. By understanding proper lightning storm safety, no one needs to worry about thunderstorm hazards. 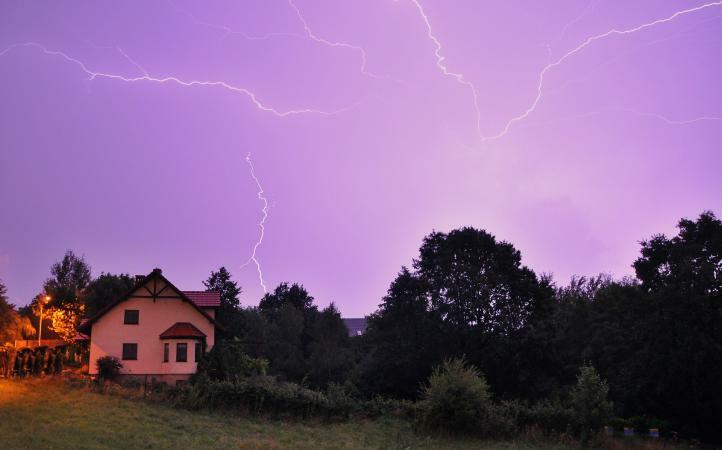 Practicing good safety habits during even the mildest lightning storm is the key to minimizing risks, but safety precautions are different whether individuals are indoors or outdoors. Do not use telephones, headphones or electrical appliances during the storm - lightning can travel through the wires and produce shocks to anyone using them. Note: Cell phones are safe to use during lightning storms because they are not physically connected to the wires. Avoid bodies of water, open areas, high ground, tall objects such as trees or light poles, and any metal objects such as fences, wires, metal sheds, golf clubs, bikes, or construction equipment. Avoid small shelters and pavilions in open areas that may attract lightning strikes. Do not find shelter under trees or if necessary, choose the smallest trees in the area. When lightning is in the immediate area, crouch down with feet close together and head down to present the smallest possible attraction to strikes. Do not lie down as this will increase the area for lightning to hit. Stay at least 15 feet away from other individuals in the area to prevent bolts from jumping from person to person. Cover your ears to minimize potential hearing damage from the accompanying thunderclap. If driving, pull off the road to avoid being blinded or startled by lightning strikes, and stay in your vehicle with the windows and doors closed. Contact 9-1-1 immediately and provide responder information about location and the victim's condition. Check the area for potential danger and assess the victim's current condition. Assess the victim's current condition. Check to see if the victim is breathing and has a heartbeat. If the victim is not breathing, begin mouth-to-mouth breathing immediately. If the victim does not have a pulse start chest compressions (CPR) as well. Learning how to perform CPR is critical. Always check the weather forecast when scheduling picnics, camping, and other outdoor events. Know where the nearest buildings are for shelter if a storm arrives. Recognize the signs of potential storms, such as dark cumulonimbus clouds, distant thunder, and sudden temperature drops, and seek shelter as soon as those signs are present. Be sure all the home's electrical wiring is up to date. Use surge protectors on all appliances and expensive electrical equipment. Prune tall trees away from buildings to minimize lightning hazards. Investigate lightning insurance coverage or purchase additional insurance riders for full coverage. Keep metal toys and tools inside when not in use. Lightning can strike many miles ahead of a storm, and the best lightning storm safety is to be aware of the hazards and seek safe shelter immediately. By knowing how to react in a lightning storm, it is possible to avoid many risks and hazards that can lead to serious electrical injuries.